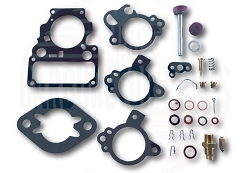 Stromberg carburetor rebuild kit. Ethanol ready. US made. Please be sure to match your carburetor number, or you will be guessing. kit was exactly what I ordered. Parts all fit correctly. Excellent pack with everything I need plus more. I appreciated the vast amount of information and illustrations that are available on your site. In fact I found the kit cheaper somewhere else but I happily paid more at your site due to the additional values found here. Perfect kit. Price was a good value and shipping fast! Q: I have A 1932 Chevrolet with storm berg bxov-2 carb body has #p-23854 under the bxov-2 is #385747 this carb has check valve with pin in it.under the accelerate pump and power valve. where do I look for carb # ? Q: how do you set the manual metering rod on stromberg bxov-2 carb.? Q: What Jet is provided with the kit ? A: The two brass pieces shown in the kit photo are the "Jet-pump bypass" and "Jet-power bypass"
Q: I have a 1970 GM Holden Red Engine fitted with a Stromberg carburetor. Code on the carb. body is BXUV-2 and the numbers 376050 underneath. 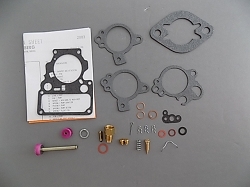 Is the K4256 the correct carburetor rebuild kit for that carburetor? 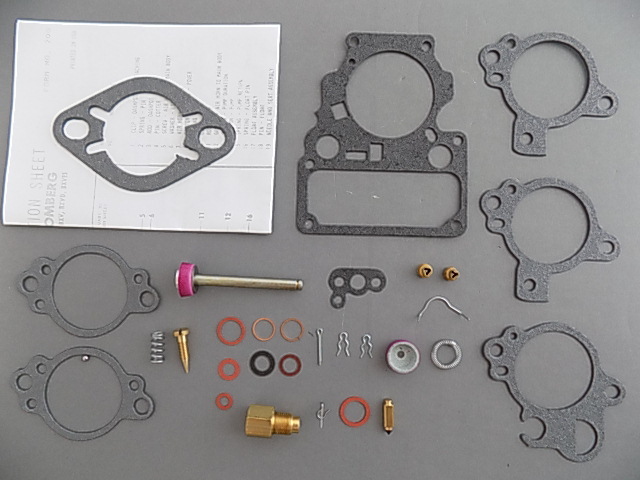 (I am mainly after ethanol ready gaskets.) Thank you. A: Sorry I can't find that carb number or a matching application anywhere. You could try matching the kit by comparing parts. All of our gaskets are US manufactured and ethanol ready. Q: I have a International Harvester A110 ex Army 1950 ute running a 283 cid engine with twin Stromberg carbies BXUV-3 with numbers 237295 on base & 2376006 on the top. Is this kit suitable ? Q: i have a bxuv3 carb with a brass tag that reads 1-99D . which kit should i buy too rebuild and do you have a video of rebuild ? A: We do stock kits for the BXO series, do you have a carburetor number? Otherwise it's a matter of comparing the parts in the kit to those on your carb to be sure it is correct.